There's a chance that Wolfe might not get that Sunday slot. Currently, Alabama (like Auburn) has Sunday listed as TBA. 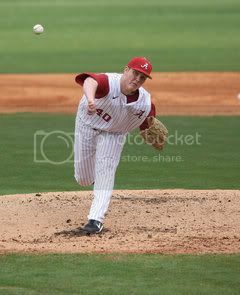 Either way, if Alabama loses, it will probably be due to their bullpen collapsing. Of Bama's 7 losses only 2 were attributed to a starter. 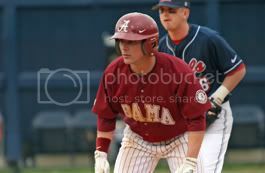 Jonathan Smart took the loss against Auburn and Tucker Hawley took the loss against UAB. In fact, if you look at the split ERAs. 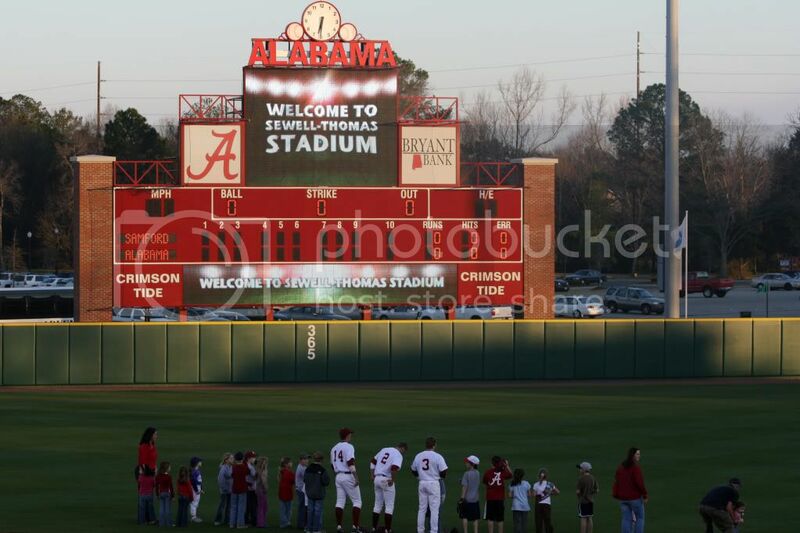 Bama’s starters (Nelson, Morgan, Wolfe, and possible starter Smart) have an ERA of 3.48. Compare that to the ERA of the bullpen (minus those 4 guys) and it jumps a full run higher to 4.41. 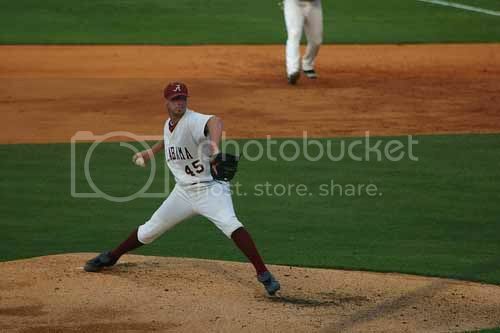 On the flip side, Auburn has a starter ERA of around 5.48 (Nelson, Luckie, Dayton, Jacobs). Compared to a bullpen ERA of 3.99. 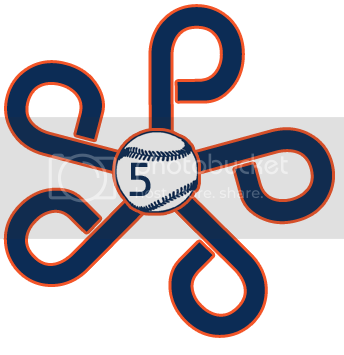 For Auburn, the story is a little bit muddled because of our wonky rotation. If you add Slade Smith and Dexter Price (who doesn’t have a relief appearance this year) then the ERA’s level out a bit, with the starter stat line being dropped to 4.95 and the bullpen line raising to 4.28. 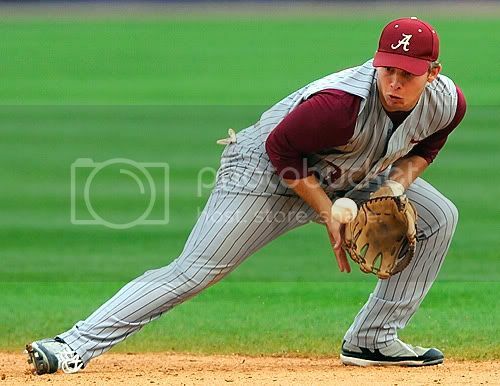 Still, for Alabama to have that big a jump from starter to bullpen shows that’s where their weakness lies. Pitching wise, it’s all about Jimmy Nelson (above). He’s the stud for Bama. The 6’6 Junior from Niceville is one of the best pitchers in the league and he’s got the stat line to prove it. He ranks 4th in the SEC in ERA (1.78), 11th in Ks (34), 9th in Opponent’s Batting Average (.219). He’s a perfect 4-0 on the season and he’s only given up 7 earned runs. 7. He works all around the plate and doesn’t leave anything up in the zone (he’s only given up 1 HR all year). He’ll face Auburn’s best in Cole Nelson and Saturday sets up to be a huge pitching duel with both these behemoths facing one another. to have any success, the Tigers will have to get out of their mini hitting funk and capitalize on what little opportunities the Tigers might have. When the best offense in the SEC meets one of the best pitching staffs, then something will have to give. Pitching wise, it’s not even close. Alabama doesn’t give up runs (or hits), so for Auburn to have any success, the Tigers will have to get out of their mini hitting funk and capitalize on what little opportunities the Tigers might have. When the best offense in the SEC meets one of the best pitching staffs, then something will have to give. Alabama has no problem getting guys on. It’s getting them home that seems to be the problem. They can dink and dunk single all day. They also seem to have a problem rallying with 2 outs. In a pretty surprising statistic, when Alabama batters get up with 2 outs, they will hit that 3rd out almost 75% of the time. Good news for Auburn because shutting the door seems to be the Achilles heel. Auburn will go with a left hand heavy lineup (which favors the Tigers). Lefties are hitting .300 against Bama while righties go down to .250. The key to this weekend is to make the most of opportunities. Alabama is dynamic in the field and it’s one reason that team pitching stats are so low. 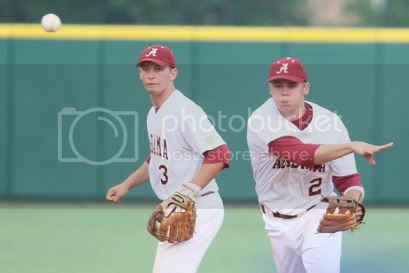 Wilson and Rutledge (2B and SS respectively) form a dandy tandem. 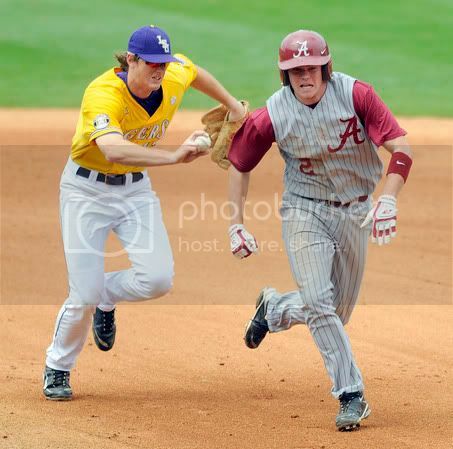 The Tide pitchers won’t try to overpower you, they have enough confidence in their fielders (who rank 10th in the league in errors and have the third best fielding % in the SEC) to get the job done. The HRs might be at a premium, but for Auburn the secret should be sticking with the small ball and station to station baseball. That has been the key all season. Manufacturing runs. The hits should still keep coming for Auburn. We’ve face two of the best staffs in the nation (Carolina and Arizona State) yet still rank statistically as one (if not THE) best in the league. Like I said, something has to give. What should make or break Auburn this weekend is limiting mistakes. Errors have been costly all season, and never as much as the past two losses. The Cole Nelson gem on Saturday was ruined by shoddy defense and the Troy game on Wednesday was blown by poor fielding. That’s two losses that could easily have been changed. If Auburn wants to win these close pitching duels, that’s where the difference lies. PREDICTION- I won’t pick against Auburn here. I can’t do it. Both of these teams are pretty evenly matched and the Alabama pitching is almost negated by the Auburn hitting. The Auburn pitching is helped by a low hitting Alabama club. Both teams will come in with almost identical records. Alabama has struggled a bit more over the past few games. Both teams took midweek stumbles against in-state foes. For Auburn, I think they know what’s at stake. A series win here and you give yourself tremendous breathing room in the SEC race. Coach John Pawlowski needs that signature win. Let’s let this be that for him. 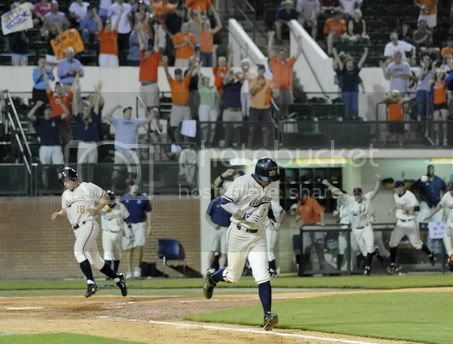 Last year’s series win (below) was great for Auburn. Especially this. Auburn won’t be intimidated or scared and should be hungry to get back to Hoover. AUBURN WINS TWO OUT OF THREE.